I have always liked the idea of sweet potatoes (or yams). They taste great and have a brilliant orange colour when cooked, but so often they don’t taste quite right when you switch them for normal potatoes in dishes. This is probably because of their sweetness, which can seem odd in otherwise savoury foods. A while back, I finally hit upon a way of cooking them which works brilliantly, is really simple and tastes delicious. I know this might not seem very exciting, but I think it is. Just peel them, rub in oil, cover in foil and then bake in a hot oven. That’s it! This makes the outside caramelise, while the inside stays soft and moist. It also means that you don’t have the skin afterwards. I am happy to eat potato skins normally, but I just don’t like them on sweet potatoes. No logic to that! The whole cooking-in-foil business is, in my view, necessary, as they can otherwise dry out and the skin can go a little tough. The magic here comes with the topping – cook up a few spring onions in a pot, jazz it up with a little spice of your choice, then allow to cool and combine with some feta. Then top off with a a few uncooked spring onions and a little extra feta, plus whatever else you like (I used sumac powder and black onion seeds, as I happened to have these in the store cupboard, but feel free to go wild with what you have). The taste is sensational – the very salty cheese and the sweet/savoury flavour of the onions works well with the warm, sweet flesh of the potatoes and tastes sublime. The spices then dance around in the background, supporting the main show. Really tasty, for summer or winter, and very, very easy to make. Sure, they sit in the oven for a while, but you don’t need to spend more than five minutes in the kitchen. Prepare the potatoes – peel them and rub each lightly in olive oil. This will prevent discolouration, and improves the surface during cooking. Wrap each in foil, place in the oven, and cook for around 1 hour, until the potatoes are soft and you can easily insert a skewer. If you like extra crispness, once the potatoes are cooked, remove from the foil, place on a baking tray and put back in the oven for 5 minutes. In the meantime, prepare the topping. Finely slice the spring onions diagonally. Add three-quarters of the chopped spring onions to a saucepan with a spoonful of olive oil, and cook until soft but not brown. Add salt, pepper and cumin (if using). Allow to cool, then add three-quarters of the feta. Mix well. However, if feeling lazy, don’t bother cooking the spring onions – just put all of them them in a bowl with oil, salt, pepper, cumin and all the feta. Mix, then use. Easy! Split the cooked potatoes in two. 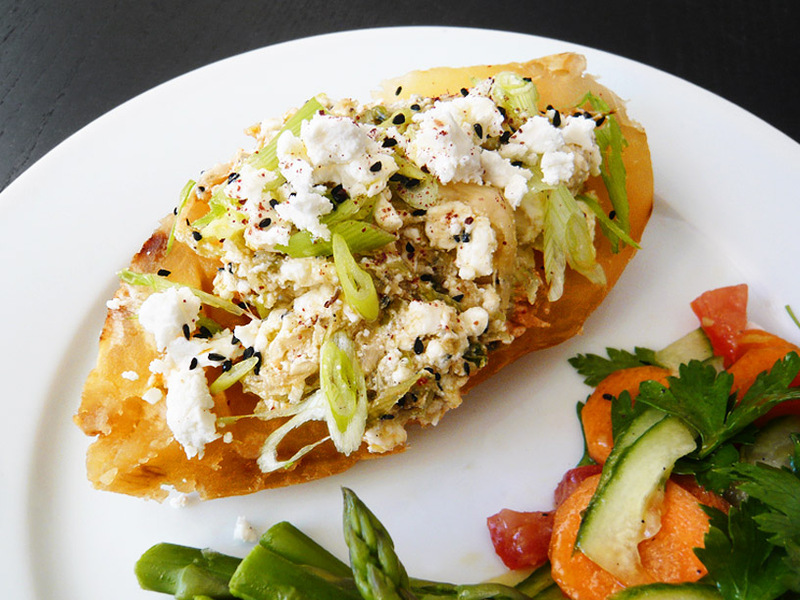 Divide the topping across each half of the potato, then add some of the reserved feta and spring onions. Finish off with a sprinkling of sumac and black onion seeds (if using), and a final drizzle of olive oil. Worth making? This is both easy and makes a sophisticated taken on the baked potato. I’ve successfully varied it with different spices, or by adding a little strong cheddar. Halloumi could also work. Just be sure to use a cheese that packs a punch, so that it simultaneously stands up to and complements the sweetness of the potatoes. Yum!